--> It's always nice to know a little history and other information about the area you're visiting or to which you're moving. Just click on one of the town names below and familiarize yourself with the communities in Tuolumne County. Enjoy reading these pages to find out why we feel this is the next place where you will want to vacation. . .if not call home. Big Oak Flat is another old mining town located adjacent to Groveland. It also played an important role in the building of Hetch-Hetchy, the water project that diverted water to thirsty cities. One-way driving time from the junction of Highways 49 and 120 in Moccasin is approximately 15 minutes. Leaving Highway 49 near the Moccasin Powerhouse complex, Highway 120 makes a steep, corkscrew climb, gaining nearly 2,000 feet in just over five miles, as brushy hillsides give way to pine-clad slopes. As the highway levels off, it passes the site of the historic Priest Hotel now marked by a motel and restaurant. At an elevation of 2,803 feet, Big Oak Flat is a quiet village of 200 with a gas station, stores, and limited accommodations. During the Gold Rush; however, it was a lively camp surrounded by rich placer deposits which yielded several millions in gold. A few old buildings still stand, including the two-story, iron-shuttered I.O.O.F. Hall, which dates from 1853 and is still in use. Just east of the hall stands a one-story stone-and-brick building from the 19th century that boasts a stone walkway and six large green doors made of iron. A monument near the west end of town displays pieces of wood from the big oak hanging tree. This tree gave the nickname Garrote to Big Oak Flat (French for hanging). Not to be outdone, their neighbors called their village First Garrote (now Groveland). However, a local miner found a nugget at the base of the big oak. Many miners started digging into the roots of the big oak until it finally toppled over because it didn't have enough dirt left to hold it up. The monument containing the piece of oak is all that's left of Big Oak Flat's hanging days! After being banished from nearby camps by intolerant Americans, a group of Chinese miners settled this area, which turned out to have rich gold deposits. By 1856, Chinese Camp had become the hub of a large network of transportation routes and boasted a population of 5,000, most of whom were Chinese. During that year, the town was the scene of an event which became known as the Chinese Tong War. A disagreement among Chinese miners resulted in a battle challenge between to local tongs (secret Chinese societies). Preparations went on for several months with all available blacksmiths for miles around commissioned to forge spears, knives, and various crude weapons. Over 2,100 Chinese gathered at the foot of Table Mountain, but the war never really happened. It was over before it had hardly begun with only a handful of injuries and no deaths. The population today is only about 150 and a number of empty buildings and a small general store/gas station at the north end of town. Chinese Camp is a sleepy village located at the junction of Highway 49 north and Highway 120 west. A number of old wood-frame houses line its streets, along with the decaying shells of several Gold Rush-era structures. On Red Hill Road, the modern Chinese Camp School, in keeping with the town's name, has a low, red, pagoda-style roof. The lacy tree of heaven, planted wherever Chinese miners settled, flourishes throughout the village. Interesting Gold Rush remains include the stone walls of Wells Fargo. The St. Xavier Catholic Church, perched on a hillside on the east side of the highway, was erected in 1855 and restored in 1949. Timothy McAdams Store is now an office of the Tuolumne County Visitors Bureau. On March 27, 1850, Dr. Thaddeus Hildreth, along with his brother George and a handful of other miners, found gold. The area where they found it is the best preserved Gold Rush town in California. They first called it American Camp and then later to Columbia. It's had its ups and downs, but in 1945, the State Legislature created Columbia State Historic Park. In 1949, the town was renovated and now many of the buildings used during the Gold Rush are being used again. Columbia's first year was almost its last. Water. There wasn't any. In June 1851, the Tuolumne County Water Company was formed to bring water into the area. The rates were quite high so the miners formed the Columbia and Stanislaus River Water Company in 1854 with the express purpose of building a 60-mile aqueduct to supply the mines. The system was completed in 1858, just when the gold seemed exhausted and the miners were moving out. Columbia's tents were being replaced with more permanent structures and by the end of 1852, there were 150 stores, shops, saloons, and other enterprises. In July 1855, the New England Water Company provided piped water for firefighting. The pipes under the streets lasted until 1950 when they were replaced by the State. After 1860, the thirst for gold grew as the easily obtained placer deposits were all but played out. Vacated buildings were torn down and the sites mined for gold. Today, The Gem of the Sourthern Mines, as it is referred to, is a living museum of the past. Along its tree-lined streets were several motion pictures have been filmed, are dozens of authentically reproduced businesses of the 1850's and 1860's. On a stroll through town, you can view an old-time pharmacy, newspaper office, watch a wooden coach take shape at the blacksmith's shop, watch candy being made, learn to make soap and candles, and much more. The main street is closed to motorized vehicles so it almost feels like you have stepped back in time. The Wells Fargo Express building is probably the best known in California. It was built in 1858. The City Hotel was first opened in 1856 and fully restored in 1975. It now serves as a training facility for hotel-management students from nearby Columbia College. The hotel also features a saloon and an elegant dining area. The Columbia Gazette office is a replica of the original newspaper office built in 1855. The Gazette is still an operating newspaper. Other attractions include the Columbia House, a period restaurant and the working Blacksmith Shop. Next to this shop is a carriage house which houses several carriages. These carriages are reproductions left to Columbia by a Hollywood studio. It is the only thing in Columbia that only looks old! Referred to as the Gateway to Yosemite, Groveland is an old mining town eight miles east of Highway 49. It also played an important role in the building of Hetch-Hetchy, the water project that diverted water to thirsty cities. One-way driving time from the junction of Highways 49 and 120 in Moccasin is approximately 20 minutes. Leaving Highway 49 near the Moccasin Powerhouse complex, Highway 120 makes a steep, corkscrew climb, gaining nearly 2,000 feet in just over five miles, as brushy hillsides give way to pine-clad slopes. As the highway levels off, it passes the site of the historic Priest Hotel now marked by a motel and restaurant. Groveland, once called First Garrote, was originally settled about 1850 by Mexican miners, who were subsequently driven away by Americans. It is today, slightly larger than its immediate neighbor, Big Oak Flat, and also offers basic tourist facilities, including several bed and breakfast inns. Groveland's attractive main thoroughfare is lined with false-front and two-story turn-of-the-century structures. Among the buildings remaining from the Gold Rush is the Iron Door Saloon built in 1852, still flourishing and claiming to be the oldest saloon in California! In June of 1848, Benjamin Wood and party camped beside the small creek. The next day, they found some nuggets. A short time later a 150-pound gold mass was discovered. According to the Bureau of Mines, this mass resulted in 75 pounds of gold. The encampment was called Wood's Diggings and later, Wood's Crossing. The creek was also named for the man from Oregon who discovered the first gold in Tuolumne County. The camp was moved about a mile away from the creek because of great flooding during the rainy season. The next spring, Col. George James, a San Francisco lawyer, arrived in the camp and treated all the miners to champagne. The miners were most appreciative and re-named the camp in his honor (Wood had moved north and was later found dead under suspicious circumstances). Additionally, James was named the camp's alcalde (chief judicial officer). He lost some favor when he let off a proven killer with simple banishment from Jamestown. But, there was more. Col. James had hired local miners to work his claims and paid them in scrip. He soon realized that he couldn't possibly find enough gold to make good on the scrip. He left town in the wee hours with his Mexican concubine. The miners were quite angry. Many were left with nothing but the shirts on their back. They tried to rename the town to American Camp. However, there were already several towns by this name and the U.S. Post Office (1853) had established an office for the name Jamestown. Mining continued off and on through the years until 1993. On Christmas Eve in 1992, miners at the Jamestown Mine discovered several large pieces of gold. One of the larger ones is on display at Ironstone Vineyards in Calaveras County and weighs 45 pounds. It is the largest piece of rare crystalized gold on display. With a population of about 2,500, Jimtown, as it is affectionately called by many locals, with its brightly painted two-story buildings along Main Street, is an oasis. Despite losing a number of its original wood-frame buildings to a fire in 1966, Jamestown still sports several structures dating from the 1850's, 1870's, and 1880's. Most of these old balconied buildings are now occupied by various businesses, including a profusion of antique shops, award-winning restaurants, a small grocery, and more. Railtown 1897 State Historic Park is located on the southeastern edge of town and contains the workshops, roundhouse, and three steam locomotives and cars of the Sierra Railway. This operation began in 1897 and is open daily from 10 a.m. to 5 p.m. Excursion trains run on the weekends. Its steam engines have appeared in more than 300 motion pictures, television shows, documentaries, and commercials including Little House on the Prarie, Back to the Future III, and Bad Girls. Other interesting buildings in Jamestown include the Community Methodist Church built in 1851 making it one of the oldest churches in the Mother Lode. The first minister of this church was a Rev. James. Probably one of the best known and most photographed buildings is the Emporium, built in 1897. With a population of nearly 5,000, Sonora is the County Seat. It's a colorful, bustling little city (the only incorporated city in the County). Sonora's economy revolves around lumbering and agriculture, as well as tourism. The city's narrow streets wind up and down and across the slopes of several hills, and along the bottom of steep-walled ravines. This one-time rowdy mining camp still features many relics from its flamboyant past, including a variety of Victorian homes. Known as Queen of the Southern Mines, Sonora was the biggest, richest, and wildest town in the southern Mother Lode. It was settled in 1848 by miners from Sonora, Mexico, who found several gold deposits (called it Sonorian Camp). Almost overnight, the camp mushroomed into a Latin-flavored metropolis with adobe houses, fandango halls, and bullbaiting. However, soon the American miners learned of its riches and were incensed to find foreigners working the rich diggins. The resulting racial strife saw many of the Mexicans becoming outlaws, raiding, robbing, and murdering the Yankees. Lawlessness was rampant and no one walked Sonora's streets unarmed. The situation came to a climax when the state legislature passed a law requiring foreign miners to pay a monthly tax of $20 per man. After some gunplay, over 2,000 Mexicans departed Sonora. Ironically, the tax proved to be the end of Sonora as a boomtown. Things were so quiet that the local newspaper folded for lack of patrons. The tax was found to be illegal and was repealed in 1851, but Sonora never regained its pre-tax wickedness. It became known for its orderliness and civilized character. Four devastating fires brought widespread destruction, but Sonora always bounced back. Located just three miles from Jamestown, Sonora marks the junction of Highways 49 and 108. Highway 108 leads east into and across the Sierra Nevada and provides access to many recreation areas. The Tuolumne County Museum and History Center is housed in what once served as the town jail. It was originally constructed in 1857 and rebuilt in 1866 following a fire. The Museum chronicles the history of gold mining in the County. Probably one of the best known buildings is the St. James Episcopal Church, located near the north end of town. Known as The Red Church, it is considered to be the most beautiful frame building in the Mother Lode and is said to be the second oldest Episcopal church of frame construction in California. The Gunn House, built in 1850, served as the home of Dr. Lewis C. Gunn and then as the office of the Sonora Herald, the area's first newspaper. The Street-Morgan Mansion, considered one of the most beautiful old homes in the Mother Lode, was designed in an intricate, elegant Victorian style. It's painted the same dark red as the St. James Episcopal Church, which is directly across the street. 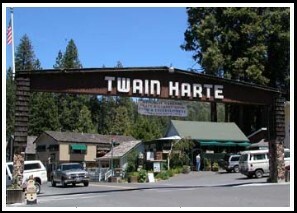 Twain Harte is different than many of the other Gold Country communities. While this area, like others around it, is honeycombed with old gold mines, Twain Harte itself is newer than its neighboring Gold Rush-era towns. Not much gold was discovered here because of its elevation. The town was originally called Twain Harte Resort in 1924 by Kehtura Wood from her husband's two favorite authors: Mark Twain & Bret Harte. Some of San Francisco's wealthiest families soon discovered this resort among the pines. Its quaintness and natural beauty subsequently attracted visitors from a much wider geographical area. Today, Twain Harte has a sizeable year round population but continues to attract a growing number of tourists who quickly appreciate what a special place they have discovered. Twain Harte is nestled in the pines just off Highway 108 about 10 miles to the east (and above) Sonora. The elevation here averages about 3,800 feet, enough to enjoy something all too rare in California: 4 seasons! Those who live here say it's perfect: high enough to be out of the smog and fog, and out of the hot summers in the valley; high enough to offer enough snow in the winter to be scenic, but not overly bothersome. Twain Harte is considered one of California's premier retirement areas. There's plenty to do for all ages. Locals and tourists alike enjoy a round of golf among the pines. Nearby Dodge Ridge offers great winter skiing. There are several scenic lakes with fishing, boating, and swimming. The Twain Harte community itself offers first class accommodations with a myriad of restaurants and quaint shops.